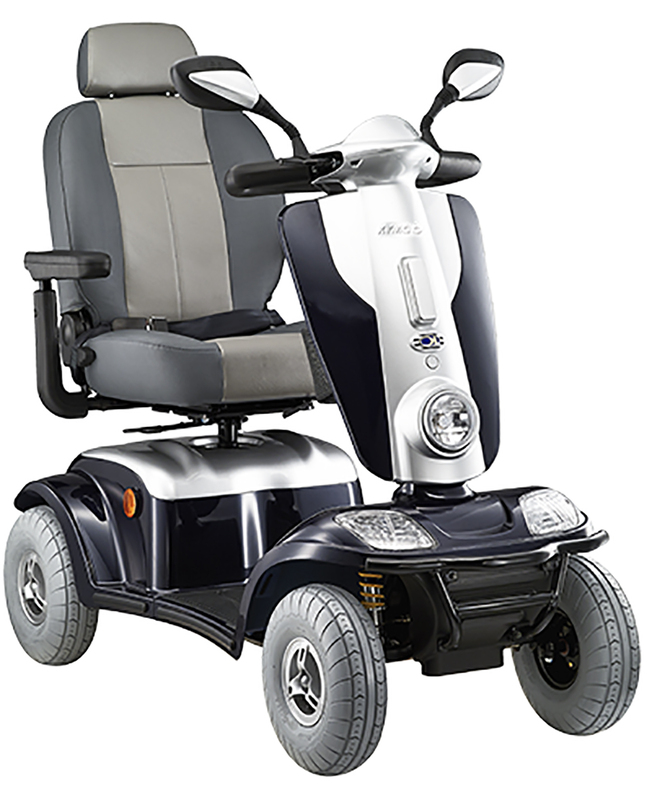 A robust 8 mph mobility scooter which offers unrivalled comfort and performance.The simple control panel will allow you to switch between 4mph and 8mph, view time, temperature, and active the horn. Price excluding VAT.(Incl. VAT £3,598.80) *VAT Relief available on this product. The Kymco Maxi XLS is the ultimate in high performance which can make even the most challenging terrain comfortable. Kymco who began life as a motorcycle designer has brought the very best design across to the mobility scooter market. You have the choice to add pneumatic tyres as standard or premium low-profile puncture proof wheels. The comfort levels are enhanced further by the padded captain's seat which has a swivel action to help you transfer to and from the scooter. The delta style handlebars provide more control, especially for people with weak hands and wrists. All this means that you’ll have no problem finding that optimum driving position. The large bumpers on the front and back will protect you from any bumps or scrapes. It’s also equipped with a fully adjustable suspension system to aid the smoothness of ride quality. The ground clearance is a very respectable 4” which only adds to the quality of your journey. As this is a road class scooter, there is powerful LED lighting on the front and rear, indicators on the side. The rear-view mirrors complete features which will make you safe when driving on roads, pavements, or on those dark evenings. The simple control panel will allow you to switch between 4mph and 8mph, view time, temperature, and active the horn. The Maxi XLS is excellent for many different occasions, whether you’re looking to use locally or a little bit further. It has a travel distance of 30 miles on a full charge, a top speed of 8mph, and can be used on the road.